Nowadays the department is headed by Suleimenova Oran Yakhmetovna, an excellent worker of RK Public Health, Candidate of pedagogical sciences, assistant professor, a member of RK association of German teachers. 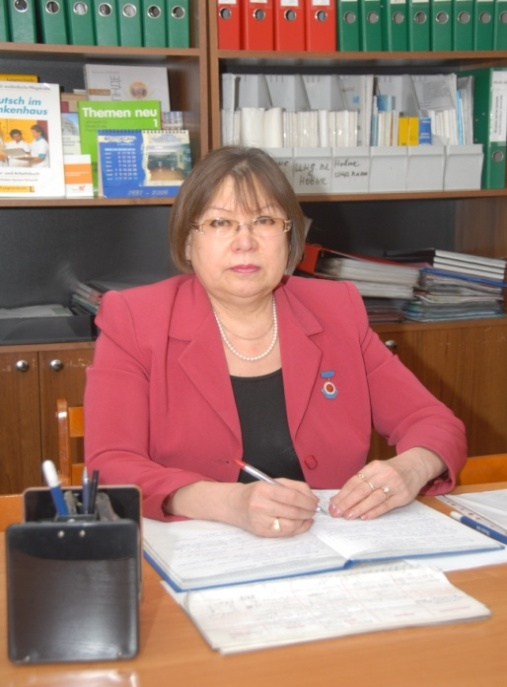 She is the member of the Academic Council of university, Association of teachers of German of the Republic of Kazakhstan and scientific organization at institute of Goethe, the deputy chairman the COP of social and humanitarian disciplines, the chairman of the commission on reception of examinations of students, undergraduates and residents. She is awarded by a silver medal of university, has a rank “Honoured worker KAZNMU”. And in 2013 she was awarded by a breastplate of the Ministry of Education and Science of the Republic of Kazakhstan “Ybyray Altynsarin”. In 2012-2013 academic year a staff of the department includes 29 workers, of them 1 assistant professor, 7 senior teachers, 15 teachers and 2 trainee-teacher and 4 laboratorians. English and German teachers of at the department the students of the 1st and 2nd courses of all faculties, and also mastership students and residents are taught English and German languages. 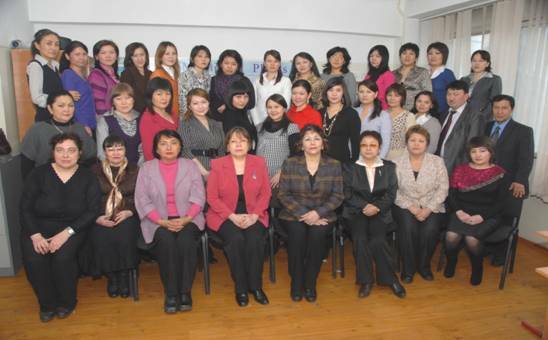 Many experienced teachers as assistant professor Suleimenova O.Ya., senior teachers Sadykova A.A., Sagantayeva S.Kh., Lozenko I.V., Yelenova A.K., Biktasheva G.M., Bayanbayeva A.A., Kaibaldiyeva B.M., teachers Ultanbekova Z.T., Bizhanova A.A., S.T. 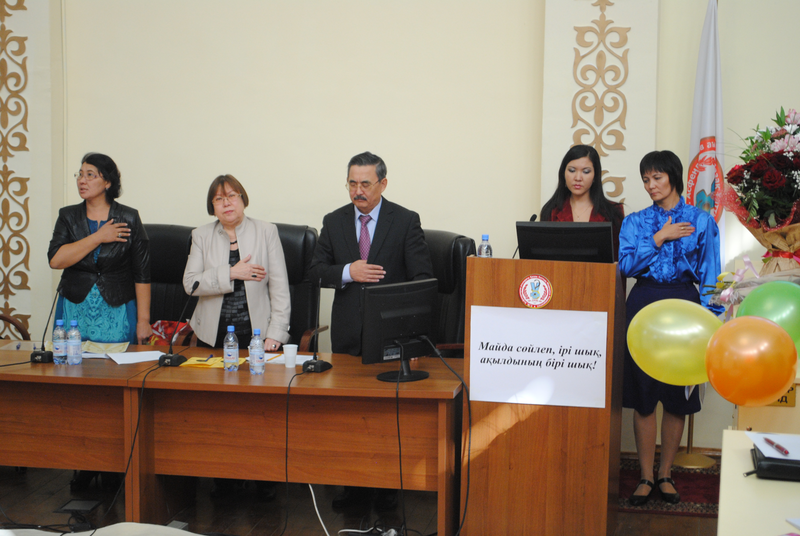 Salpebayeva and others who give the students all their knowledge, work at the department. The great interest both as for students and teachers have meetings with famous scientists – doctors, interesting people, representatives of different educational programmes such as fund “Soros – Kazakhstan”, management of Gete Institute, training, holding by professor from Keniya on the problems of AIDS, meeting with representatives of the American embassy on the problems of studying abroad, managers of international programmes “Bolashak”, representatives of educational programme in Germany DAAD, with scholars from Canada, America, Japan studying on President’s programme. The participants of meetings made their speeches in the English and German languages.